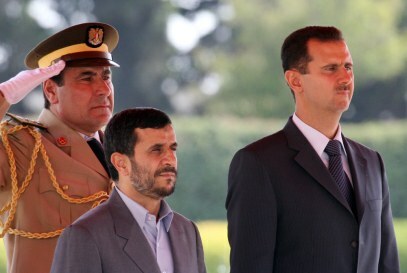 Iranian and Syrian Presidents Mahmoud Ahmadinejad, left, and Bashar Assad listen to national anthems at the Ash-Shaeb presidential palace in Damascus. Learn more about the ethnic, religious and political power plays in and around Iraq during a briefing of the region led by NBC’s Richard Engel. Iraqis try to maintain normalcy in their everyday lives against a backdrop of violence. Aug. 24: Iraqi journalists are vital for Western news outlets, but they face "the most dangerous assignment in the world." The youngest Iraqis reflect on life in war and share their hopes and aspirations. Three U.S. soldiers tell how the visible and invisible wounds of war changed their lives and impacted their loved ones. The path to descent of Iraq’s Saddam Hussein. Over the past few months, there have been reports of contacts between Syrian and Israeli officials via third parties. Israeli prime minister Ehud Olmert confirmed that he has made overtures to Syrian president Bashar al-Assad to restart the talks between the two countries that have been stalled since 2000. What’s the Israeli strategy here? Is Olmert concerned about another war in Lebanon? Does he believe that Syria might be contemplating an attack on Israel? Possibly, but the most likely explanation for the approaches to al-Assad is Israel’s belief that the primary threat to the Jewish state is Syria’s key ally in the region — Iran. Israel’s concern with Iran goes beyond the suspected Iranian nuclear weapons program. Although Israeli leaders consider Iran armed with nuclear weapons as an “existential threat” to the country, they are also concerned with Iran’s continued support for some of Israel’s worst enemies — Hezbollah in Lebanon, and Hamas and Islamic Jihad in Gaza. That support comes in the form of money, weapons and training — and it comes through Damascus. The flow of arms and money has been almost nonstop since it began in 1982 when members of the Islamic Revolutionary Guards Corps entered Lebanon’s Bekaa Valley and created Hezbollah. According to Lebanese army officers, both Syria and Iran are ignoring United Nations Security Council Resolution 1701 that ended last summer’s war between Israel and Hezbollah. The resolution prohibits any party from importing weapons into Lebanon without the approval of the Lebanese government. The Lebanese government is powerless to stop the flow of weapons destined for Hezbollah, Hamas and Islamic Jihad — the Lebanese Army is having trouble subduing one Palestinian refugee camp. The Syrians could stop the flow of arms, but why would they? Damascus has been a close ally of Tehran since Syria backed Iran in the Iran-Iraq War. The two countries now have a formal defense pact and an intelligence sharing agreement. Israel’s strategy is simple. Make a deal with Damascus that includes the provision that Syria stop permitting the use of its territory for the transit of Iranian weapons and supplies into Lebanon. Without Iranian support, Hezbollah the political party will survive, but its militia, the “Islamic Resistance,” probably will not. Hamas and Islamic Jihad will be hurt as well, although probably not as severely as Hezbollah which relies almost entirely on Iranian largesse. But while the strategy is simple, the execution is not. “Make a deal with Damascus” is easier said than done. What does Israel have that Syria wants? That’s easy — Israel occupies the Golan Heights, seized from Syria in the Six Day War of 1967 and since 1981 under Israeli administrative control (just short of outright annexation). The return of the Golan is a visceral issue for Syrians. Without of the return of the Golan to Syria, there will be no progress in the peace process — none. The question is not if Israel will need to return the territory; it is how to do it. The Syrians insist that the Israelis guarantee the return of the area before negotiations take place; Israel wants the modality of the return to be part of the talks. There are serious Israeli concerns about returning the Golan to Syrian control, and the Israelis want to make sure these concerns are addressed. In the past, there was a worry that the Syrians would once again control the high ground overlooking the Hula Valley of northern Israel. That worry has been overcome by technology — Syria no longer needs the high ground to bombard Israel. It now has missiles capable of delivering chemical warheads to almost any part of Israel from well inside Syria. Maybe of greater concern to Israel is the loss of its large intelligence gathering station on one of the highest points in the Golan. This station allows electronic and visual monitoring of southern Syria all the way to Damascus. It is Israel’s primary means of detecting any Syrian military moves towards the border area. Ending Iran’s access to Syria is a good plan on the part of the Israelis, but it does not appear to have worked. When the Syrian president made a speech to the parliament marking the beginning of his second term in which he stated that he wanted “direct and open talks with Israel,” it set off alarm bells in Tehran. If there is one thing that Iran does not want, it is peace between Syria and Israel. The Iranians know full well the implications for their foreign policy. It only took two days for Iranian president Mahmoud Ahmadinejad to jump on an airplane and head for Damascus. Ahmadinejad did not only come with words, he brought money, $1 billion with which to buy Iranian or Russian weapons from Iran. The deal also reportedly includes construction of a missile production facility in Syria. It’s a good deal for both countries: Iran retains is access to its proxy armies, and Syria gets an infusion of badly needed cash to buy weapons. Ahmadinejad has been successful in preventing Syria from straying and causing a foreign policy crisis for Iran —so far. Is Gaza this summer's Lebanon?